You are here: Home / Blog / So what’s so scary about a pumpkin? It seems the pumpkin or Jack-o-lantern originates from the ancient Celtic festival of Samhain, which was celebrated from sunset on October 31st to sunset on November 1. This was considered the most magical night of the year – when the ‘veil’ between this world and the next was believed to be at its thinnest. The lanterns were to honour deceased relatives and friends and protect people from evil and malevolent spirits. 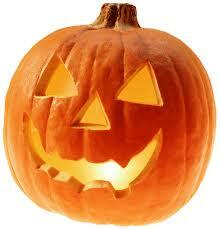 Jack-o-lanterns were originally carved from turnips, pears or gourds with burning coal inside. Burning lumps of coal, and later candles, were placed inside these jack-o-lanterns. European – notably Irish – immigrants took the tradition to America where turnips were hard to come by and so they used pumpkins instead. firmly established in the UK. Now here is a truly frightening fact: Did you know that the number 1 reason that customers leave is because they think you’ve forgotten about them? It’s estimated that 68% of customers leave for this very avoidable reason. Now that really is frightening! Accord PR is offering a scarily good deal on newsletters. Starting at just £150, we have let a crazed axe man attack the cost of our newsletter packages. Click here to find out how to bewitch your clients and customers!